International Basketball Manager: Slam Dunk Or Disappointing Rebound? I’m a keen player of management sims and Football Manager is my most played series of all time – I’ve racked up tens of thousands of hours in Sports Interactives opus – so I was excited to give International Basketball Manager its time on the court. If International Basketball Manager can deliver for basketball what Football Manager has for football fans then it’ll be very special indeed. From what I had seen, it played a lot like older Football Manager games. Once I’d got started, I saw it was more like a Championship Manager game from 15 years ago. That’s not in itself a negative — it’s actually quite charming in its own way. It’s worth noting that International Basketball Manager is still currently in Early Access so there’s the potential for a lot of things to change. The user interface is simple and easy enough to understand, although the game was clearly written in Spanish first before being translated fairly poorly into English. Occasionally during the tutorial, I would be asked to open a certain menu only to find it doesn’t exist. For example: multiple times I was asked to open the “Team” menu but in fact, it was called “Club” on screen. Sometimes, you’ll find that certain words and phrases haven’t been changed at all. Thankfully, these translation issues are easy enough to patch out and don’t detract from the playing experience too much. The main menu of the game allows the player to play a friendly match, start a new season or load a previous save – as well as change game settings if required. I started off playing a friendly just to get an idea of what I was in for. The amount of teams that you can choose from is pretty big – including fully licensed teams from all over Europe – although none of the American teams has been licensed so instead of the Boston Celtics I was playing as the Boston Clovers. Again this is a minor thing that doesn’t detract from the experience. The match engine itself is fairly simple. 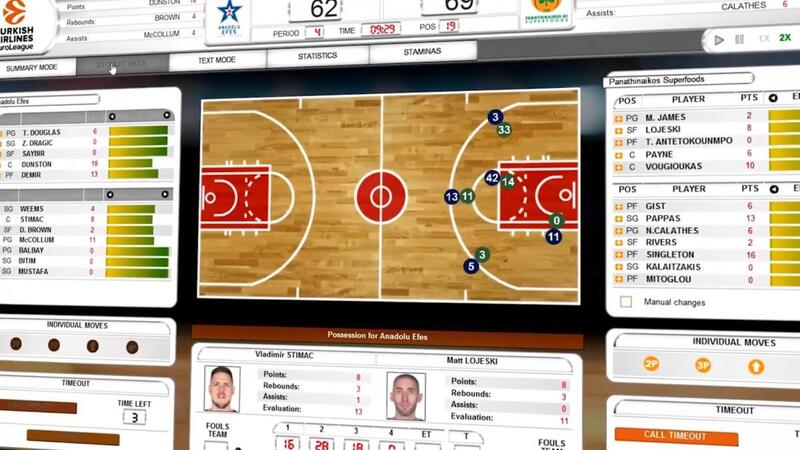 You can watch a 2D court view of the match, a text play by play as well as the ability to check match statistics, a general overview and information on player fitness all available at the touch of a button. The games play out in real time so each twelve minute quarter can be experienced down to the second, which allows you to react to things that happen in the match without any great delay — handy if you start falling really far behind. However, if you feel more confident in your team and the tactics, you can speed the match up to 2x, 4, and 8x real time and even skip the quarter entirely. What I would say, though, is that if you’re going to watch the 2D match, don’t choose 8x speed because the icons just flash all over the court making the game really difficult to follow but it also might give you a bit of a headache. After my friendly match, I decided it was time to start a season and it started off fairly promisingly. You can add several different managers and, as mentioned before, choose from one of the top teams all over the world – even if the NBA teams have slightly different names, they’re easily recognisable. Once again, I chose the Boston Clovers. This is where the tutorial came in handy. There are many menus to choose from and, at first, it can be a little daunting to know where to go to perform each task. The tutorial walks you through everything up to your first match, including choosing training regimes for your players, match time for each player and tactics to use at different points throughout a match. There’s a lot of hand-holding to start you off but it’s really useful in learning the mechanics of the game. Basketball management isn’t a well-known style of management sim and so will be new to a lot of people, regardless of their knowledge of the sport. Once you get going, you are able to experience some pretty cool features. Your manager periodically receives emails from club officials, fans and other outside sources and occasionally these emails will offer you the chance to reply. For example, the first email you receive will be from the directors of the club asking you what you think the plans for the season will be. The great thing about this is that you’ll receive immediate feedback on your decision. I told my board that I wasn’t going to make any promises about the season ahead and that we’d just have to wait and see. This garnered me an increase in support from the fans as well as increasing my standing as a manager. As you get further into the season, you’ll get the option to choose sponsors and participate in interviews with the press. I got through my first match with no real issues, winning fairly comfortably against a much weaker team that was automatically selected for me as my first opponents. It was only when I started my second match that issues arose. I was comfortably in the lead during the first quarter so decided to skip ahead to the fourth. My skipping resulted in a crash to desktop which, at first, I thought was an issue with my laptop but in fact turned out to be an issue with the game. Don’t hold that against it just yet: it’s Early Access still and these issues can be ironed out fairly quickly by the developers. After reloading the game, I managed to load my save and get through the second match but unfortunately, it crashed to desktop again shortly afterwards when I tried to change a setting. I started up a new season and managed to get a little further into it before again experiencing a CTD. There are quite a few bugs that require fixing in this, but that’s to be expected from Early Access. From the poor translations to whatever causes the CTD issues it’s far from a polished product but the game really does have potential. The premise is clever and the gameplay is enjoyable for fans of the genre. I’ll be keeping an eye out for updates that will fix these and will certainly give this game a good run once the reliability is there. Basketball is a very popular sport and, although the 2K games are fantastic, there’s a real dearth of content out there for basketball fans to get their teeth into. There’s work that needs to be done to really turn this into a great game but the foundations are there. Fix the CTD issues and the translation issues and U-Play Online will be well on their way to getting a really promising series up and running. With loot crates (mostly) in the rear-view mirror, the gaming industry wasted no time in finding other questionable business practices in 2018.